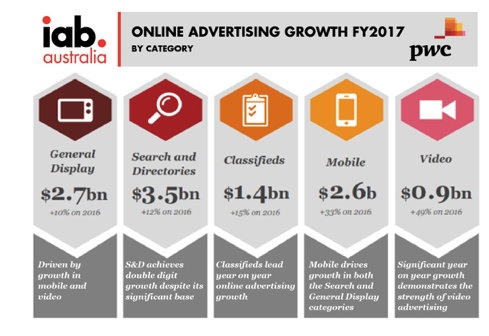 The Australian online advertising market has once again delivered double-digit growth figures increasing by $799 million to reach $7.6 billion for the full financial year ending June 30th 2017, a 11.7 percent increase over the prior financial year. “Online advertising continues to deliver robust double digit growth and now accounts for close to 50 percent of advertising spend in Australia,” said Megan Brownlow, editor of Australian Entertainment and Media Outlook at PwC. Mobile represents over 50 per cent of display dollars for the first time, whilst video advertising is rapidly increasing its share, up 49 per cent to $0.9 billion – a third of the total display market. The auto category was once again the number one display category in 2017 and saw the largest year on year growth, increasing from 17 percent of category share in 2016 to 18.5 percent in 2017. Automotive, along with real estate and retail, account for 41.1 per cent of the general display advertising market. When it came to classifieds, this category continues to grow faster than other global markets due to the strong local Australian pure plays. classifieds grew more than display and search, up almost 15 per cent year on year. Mobile advertising expenditure now exceeds $2.6 billion, an increase of $641 million (or 32.7 per cent) compared to 2016. Of this $2.6 billion expenditure, 46 percent was attributed to mobile search and 54 percent to mobile display. 70 per cent was attributed to smartphones and 30 percent to tablets. Video advertising now accounts for $894.4 million of expenditure, up $294.4 million (or 50 per cent) compared to the previous year. It now makes up 32.9 percent of general display advertising expenditure, compared to 24.3 per cent in 2016. “As mobile and video advertising continues to drive the growth in online advertising, IAB Australia is committed to helping brands, agencies and publishers improve their understanding of the mediums,” added Vijay Solanki, CEO of IAB Australia. In the three months ended 30 June 2017, total online advertising was $1.9 billion representing a year-on-year growth of 5.2 per cent and increase of 2.9 per cent from the prior quarter. All categories experienced growth compared to the same quarter in the prior year with classifieds delivering the strongest growth at 18.5 per cent. Mobile advertising stands at $721 million for Q2 and comprises general display and search expenditures – with 51 per cent attributed to mobile display and 49 per cent to mobile search. 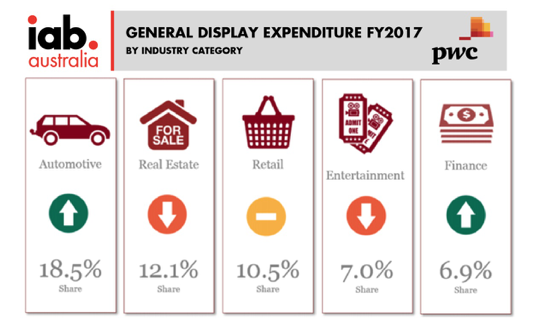 Mobile contributed 54.7 percent of general display expenditure, marginally growing its contribution from 53.5 per cent in the March 2017 quarter. Video remains a significant component of general display advertising. While year on year growth remains strong, up 32.1 per cent, video advertising expenditure experienced a softening in growth in the June quarter compared to the March quarter 2017, up 1.5 per cent consistent with the trends seen in the broader advertising market. Automotive and real estate led the general display market in the June 2017 quarter, representing 36 per cent of the reported general display advertising market. These are the only two categories with a greater than 10 per cent share, followed by retail at 7.6 per cent. Automotive has been the leading category for over five consecutive years.